"The Windstorm-Rated and Fire-Rated, Square Bolt Solution"
- Function: Latchbolt Strike Monitor (LBSM). - Delivery: Please allow 2-3 days' lead time on the HES 9700-LBSM-630. Works with Corbin Russwin SecureBolt™ and Yale SquareBolt® exit devices. The 9700 Series is a heavy duty, surface mounted electric strike designed to accommodate Corbin Russwin SecureBolt™ and Yale SquareBolt® exit devices. All components are completely encased within its 3/4" thick stainless steel housing, so no cutting on the frame is required for installation. It is field selectable for fail secure or fail safe operation, and for 12 or 24 VDC. - Separate base and decorative cover for easy adjustments. - Static strength 2,000 lbs. - Dynamic strength 120 ft-lbs. 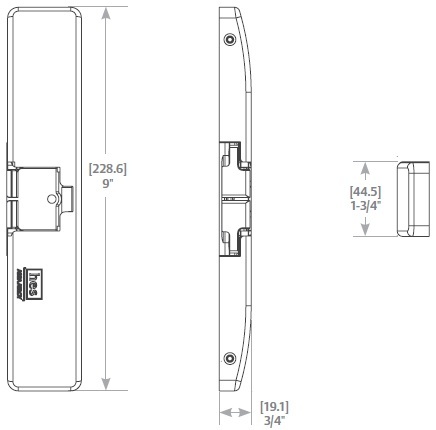 - CAN4-S104 (ULC-S104), NFPA-252 and ASTM-E152 fire door conformant. - ANSI/BHMA A156.31, Grade 1 (#E09731, #E09732, #E09373). - Patent: # 6,390,520, 6,392,520, and 8,454,520.